Spent an hour now searching for this. sorry. must be answered before but i cant find it. How do you make rs enter fullscreen when a slide is clicked. But when full screen is open, if I click the big image, the area turns white (the image disappear), and has a unusual behavior. How we can prevent this? Link to page with issue, please. 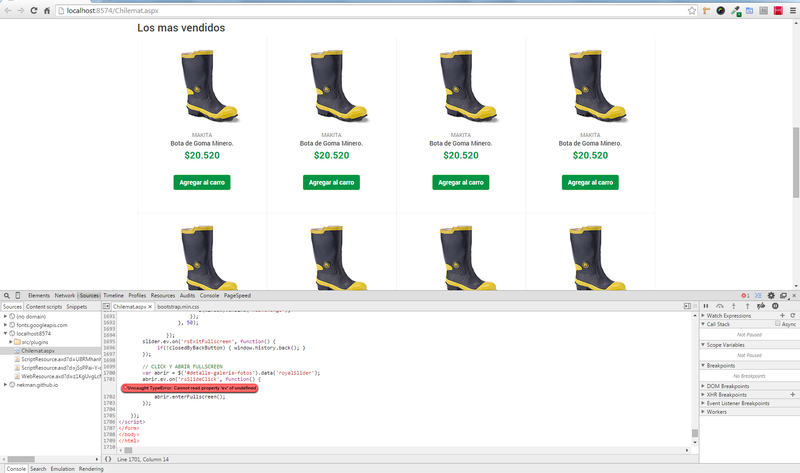 Error tells you that #detalle-galeria-fotos element isn't RoyalSlider, or RoyalSlider isn't initialised on it yet. 1) When fullscreen is opened (by clicking the image), this works fine. 2) But, inside the fullscreen, when you click the big image, this image disappear, and when you go back (closing the fullscreen), the image is not displayed in the slider. Well, just add some flag and don't call enterFullscreen method when in fullscreen. And what about this console error?. Is about the same? I forgot $(window).unbind('hashchange'); in rsExitFullscreen. It works, but there is a glitch. When you click the slider to go fullscreen a problem happens. When in full screen if you click the black background everything breaks. Can you please help me?